Lake Arrowhead Waterfront Home! Ultralux lake-living design, stylishly updated, incredibly spacious, panoramic water views, 152' of prime frontage, and beautiful sunsets! A perfect partnership of custom quality, tasteful comfort, and amenities galore, this split-ranch 5 bedroom, 3 bath beauty is lake "living" at its best! With a truckload of recent updates, this one is better than it's ever been. Special features include a warm, open design with a high cathedral ceiling throughout the living, dining and kitchen areas finished in rustic knotty pine; striking floor-to ceiling stone/wood burning fireplace surrounded by a virtual wall of lakeside windows; new wood flooring throughout main level; wonderfully updated kitchen with new textured granite countertops, large island with breakfast bar, pantry, and new appliances (4-19); Thanksgiving-sized dining space (a must for a 5-bedroom home!) with lake view; knotty pine car-siding throughout the 14x16 lakeside 3-season room; spacious master with (you guessed it) a lake view, full bath, large walk-in closet, and double vanities; two additional ML bedrooms (one is a guest bedroom with access to the main bath); finished lower level with family room, lookout windows, 2 bedrooms, full bath, and den/office; maintenance-free siding, expansive lakeside deck, and patio (all 3 are top-notch! ); 2-car attached garage w/stairs to basement; big backyard (playground/ballfield) with Jungle Gym; inviting entry from cul-de-sac with circular asphalt drive; new pier & 5000 lb lift ('18). Other updates include new HVAC, water heaters, flooring, interior paint, landscaping and Levolor blinds and shades. If you have a Brady-sized bunch this is the place for you. Lake Arrowhead ... Great Lake, Great Golf, and the always Great Outdoors! Wall Coverings: Fresh Paint. Warm Colors. Porch: Rustic 3-Season Room w/Carsiding. Great Lake View! 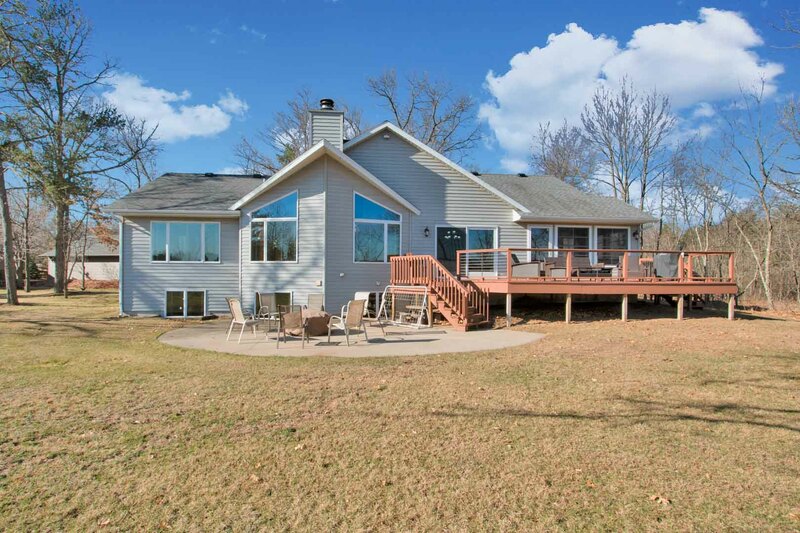 Deck/Patio: Spacious Lakeside Deck, Refinished '18. Patio.